Patient will present as → a 15-year-old boy with severe lower abdominal pain that awoke him from sleep about 3 hours ago. The pain is sharp and radiates to the left thigh. While in the emergency room, the patient experiences one episode of vomiting. He denies any fever, dysuria or chills. The mom reports a childhood history of cryptorchidism. Physical examination reveals normal vitals with blood pressure 100/60 and temperature of 98.6F. Abdominal examination is relatively benign. Scrotal examination reveals an elevated left testis that is diffusely tender. Lifting of the left testicle does not relieve pain and there is a loss of cremasteric reflex. Transillumination test is negative. Doppler ultrasound shows absent blood flow. What is a “bell clapper” deformity? How much time is available from the onset of symptoms to detorse the testicle? < 6 hours will bring about the best results (> 90% salvage rate). There is a < 10% chance of salvaging the testicle after 24 hours. Emergent surgical intervention on the affected testis must be followed by elective surgery on the contralateral testes, which is also at risk for torsion. A 5-year-old presents to your office complaining of scrotal pain and you note swelling of the left testis. What is the appropriate next step? Testicular torsion should be suspected in patients who complain of acute scrotal pain and swelling. Testicular viability is in jeopardy with delay in diagnosis, ultimately impacting the patient fertility. Associated conditions that may resemble testicular torsion not warranting surgery are torsion of a testicular appendage, epididymitis/ orchitis, trauma, incarcerated hernia, varicocele, and idiopathic scrotal edema. Testicular torsion is most common in men younger than 25 years old, although it can occur in men of any age. A prepubertal or young male adult with acute scrotal pain should be diagnosed as testicular torsion until proven otherwise. Physical exam finding of higher testicular lie and absent cremasteric reflex are supportive evidence for this condition. Scrotal imaging with Doppler color flow ultrasound is necessary when the diagnosis remains unclear. Once the correct diagnosis is established, prompt surgical evaluation should be performed. It is reasonable to perform manual detorsion for immediate noninvasive treatment followed by elective orchiopexy. A patient presenting with testicular torsion will have a negative prehn’s sign (lifting of testicle will not relieve pain). A positive prehn's sign is seen in patients with epididymitis, they will have relief of pain with lifting of the testicle. A 16 year-old male presents with increasing pain and swelling of his right scrotum. The right testicle is extremely tender to palpation on examination. A Doppler ultrasound demonstrates decreased blood flow. Which of the following is the most appropriate intervention? Oral doxycycline is the treatment of choice for epididymitis. While epididymitis and testicular torsion present similarly, the Doppler ultrasound in epididymitis would show increased blood flow, not decreased. Incision and drainage is indicated for treatment of abscesses, not testicular torsion.Incision and drainage is indicated for treatment of abscesses, not testicular torsion. Scrotal elevation and ice packs are indicated for adjunct treatment of epididymitis, not testicular torsion. Once a diagnosis of testicular torsion is suspected, emergent surgery is indicated to have the best possible chance of salvaging the testicle (85-97% chance if less than 6 hours). Any other treatment measures delay the definitive treatment and increase the risk of testicular ischemia and infarction. A 15-year-old man comes to the office with acute onset of nausea, severe pain and swelling within the right testis. He has no fever or irritative voiding symptoms. Which of the following scrotal physical examination findings would you expect in this patient? Testicular cancer is characterized by a painless nodular enlargement of the testis typically discovered by the patient. A hydrocele is a collection of fluid within the scrotum which can be transilluminated on exam. A varicocele refers to varicose veins of the spermatic cord. It feels like a soft bag of worms in the scrotum separate from the testis. 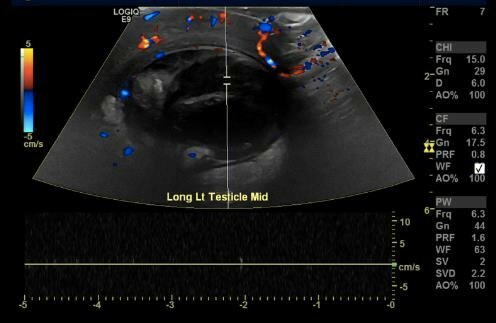 Testicular torsion occurs in the 10-20 year age group, and is characterized by acute onset of severe pain and swelling of the testis. Physical examination will reveal a tender high-riding testis.